BFP: October 22, 2013 EDD July 8, 2014! Ultrasound November 11, 2013 - Saw baby and heartbeat (122)! Ultrasound at 8 weeks 6 days heartbeat was 164! H.b. at 13 weeks was 148! Elective Ultrasound 16.2 weeks - IT'S A GIRL!!! 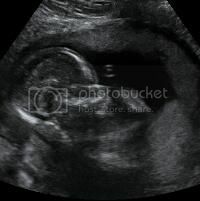 Ultrasound 18.6 weeks - STILL a girl!!! Ultrasound 20 weeks - S.T.I.L.L. a girl!!! November 6th, 2014- NIPT results; decreased risk (1 in 13,000), and It's a Girl! !